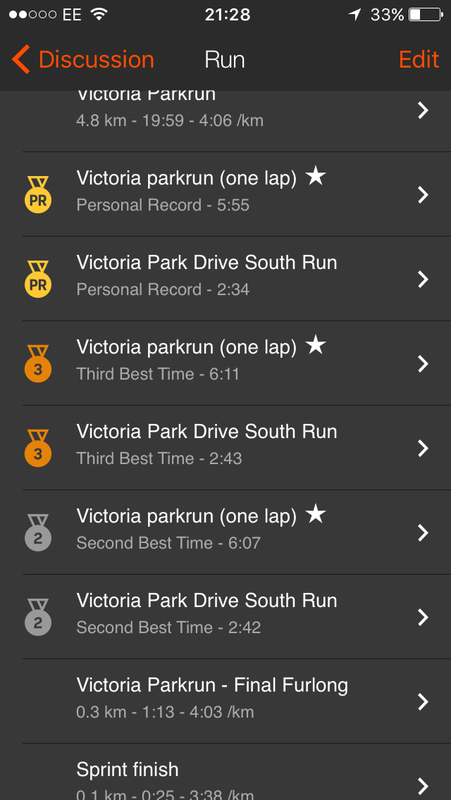 Parkrun (styled as parkrun) is the name given to a collection of five-kilometre running events that take place every Saturday morning in several countries. All are free to take part in and require runners to register online in advance for a unique athlete number and to print their own identification barcode for use when taking part. Came in and stopped the Garmin 19min59sec and 4.8something km. I queried distance with runner next to me – his Garmin had 5.05km so it must be fine – I hadn’t cut corners into the lake that was for sure. First lap quickest then got my breath back regretting start then upped it on final lap …..
Runners’ results in each event are processed and uploaded online after the run by volunteers. Each registered runner has an individual page cataloguing the details of each event in which they have participated. Pretty happy with that so will try make next week for no2 before I try other courses. Got new life insurance and the company i am with offers 50% off on garmin products and as I am such a gadget head i decided to buy the 920XT which is also useful for swimming besides my normal running and cycling. The watch itself maps other data that i was not familiar with so popped out this morning on a run just over 10km to explore what the running dynamics mean. Cadence i know is stride rate – quicker chi type running has always been my thing – i am not a long heavy impact strider … In general, more experienced runners tend to have higher cadence. An often-cited target for running cadence is 180 steps/min. So i am bang on target for this run. The colors show how your vertical oscillation compares to other runners. The color zones are based on percentiles. Garmin has researched many runners of all different levels. In general, more experienced runners tend to have lower vertical oscillation. However, faster paces often come at a cost of somewhat higher vertical oscillation. At a set cadence, shorter ground contact time is also usually associated with higher vertical oscillation. When running uphill, vertical oscillation tends to be lower. Taller runners tend to have somewhat higher vertical oscillation. Many running coaches believe that low vertical oscillation is more economical since less energy is wasted going up and down. Some also encourage a running form with lower vertical oscillation because it lessens stress and impact on the body. The colors show how your ground contact time compares to other runners. The color zones are based on percentiles. 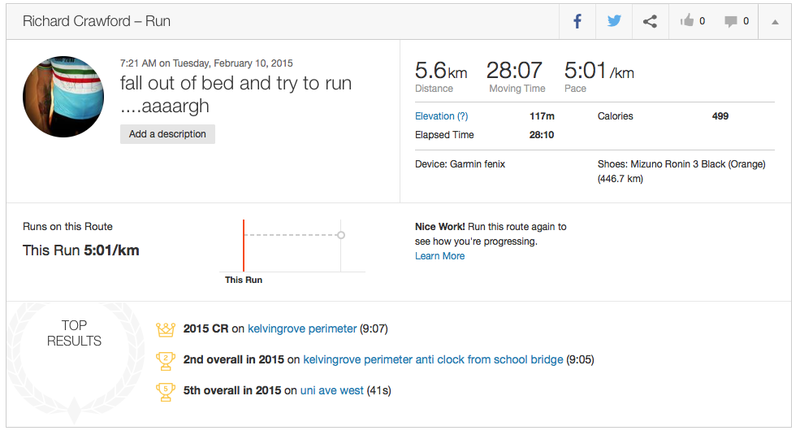 Garmin has researched many runners of all different levels. In general, more experienced runners tend to have shorter ground contact times. Elite runners often have ground contact times of less than 200 ms. Virtually all experienced runners studied have ground contact times of less than 300 ms. Higher cadence and faster paces are both associated with shorter ground contact times. Many running coaches believe that a short ground contact time is characteristic of a more economical running form. However, at a set cadence, decrease of ground contact time usually increases vertical oscillation. 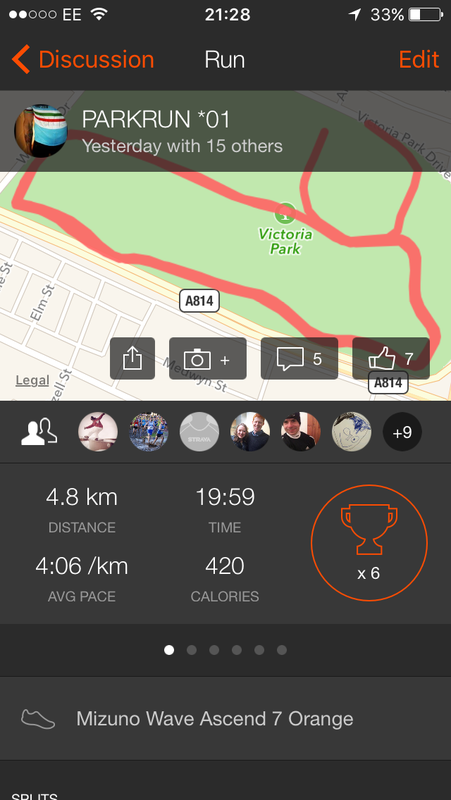 Strava, the social network for runners and cyclists, has published its annual End of Year Insights for 2015. Comprising of millions of individual runs and rides, the data offers unique insight into the habits and behaviour of Britain’s runners. The data reveals that in 2015 a staggering 5.3 activities were uploaded and shared on the social network every second. Such an immense depth of data allows documentation and analysis of the UK’s growth in the world of running and cycling, while also providing direct comparison with the Strava community on a global scale. Runners around the world clocked up 52,006,574 runs on Strava, recording the equivalent of 275,648 marathons along the way, as they reached an impressive running total of 434,262,247 km. Runners looked to the tail end of the year in order to stretch their legs and marked Sunday 13th September as the most active day for a run. Global elevation gain was one of the most astounding statistics for Strava runners, reaching the dizzying heights of 3,810,420,727 meters in total. The UK contributed 10,879,161 runs and 86,760,994 km to the global figures. Men recorded an average pace of 5:17/km for their average running distance of 8.4 km, while women recorded a pace of 6:13 over their 7 km runs. During the year, men and women spent a similar amount of time pounding the roads, parks and countryside of Britain; finishing only 36 minutes apart as men totalled 14hr 38min to women’s 14hr 02min over the course of the year. London and West Yorkshire once again locked horns for most active location, with the capital’s runners completing 1,350,078 activities to its northern rival’s 416,215. Wales proved a similarly lumpy affair for runners as it did cyclists, charting 177m of elevation on average, while also seeing Powys secure top spot in both longest average distance 9.8 km run and longest average moving time 1hr 07min. Tuesday 14th April had the most people digging out their running shoes and commuting into work, encouraging 5,751 to swap their usual mode of transport to work up a sweat instead. Commuters heading in on foot spent a minute less travelling than their cycling counterparts (38 min v 39 min) and uploaded 19,137 runs to Strava each week. This morning i dropped the girls off at their school in my running gear – I was aiming to do a 10km run (my first of the year and first in a few months) and i didn’t want to let January slip past without me completing it. 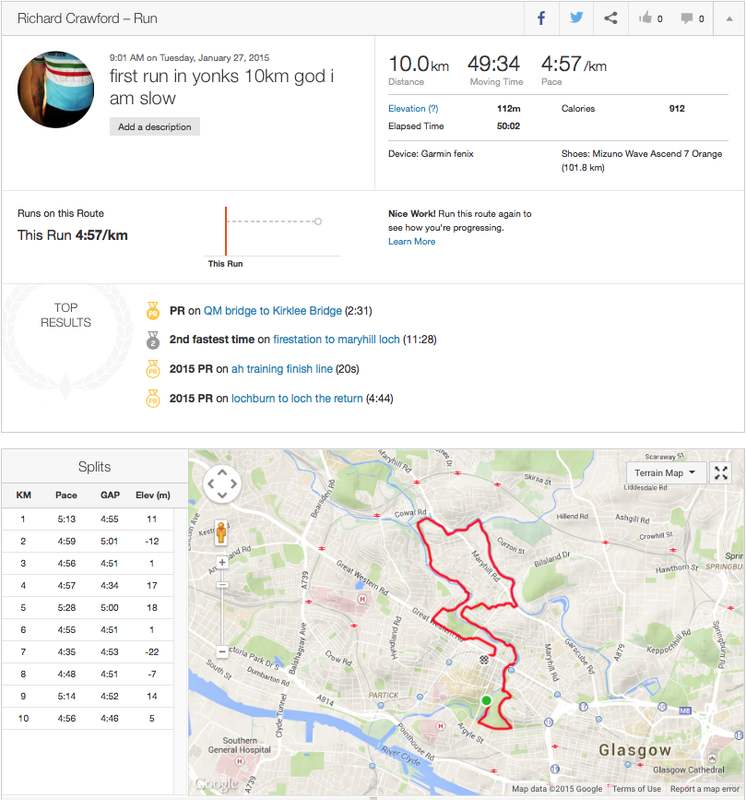 I headed out to routes quite well know and then as I was running I decided to piece together two separate parts of a run (joining a river to a canal) I ambled up the hill and then wove between streets and a makeshift park to hook the bits together …. I had to stop at one traffic light waiting to cross but otherwise it was all good fun. Small loop at the end to make sure i hit 10km and then stopped the gps at the bottom of the road as the watch said 10km.